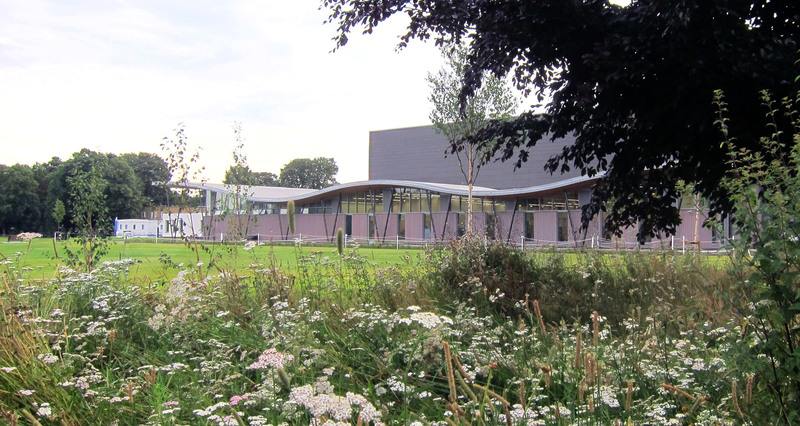 Colvin & Moggridge » Landscape for sports hall & fitness centre used as Olympic base. Landscape for sports hall & fitness centre used as Olympic base. We are celebrating the completion of the new sports hall and fitness complex at St Mary’s University in Twickenham. The project was grant aided by Sport England and the new facilities were used as the UK base for the South African Olympic Team. Looking beyond the immediate site and project brief to the wider landscape setting of the campus, we successfully overturned the presumption against new building development due to site designation as Metropolitan Open Land. Drawing inspiration from the richer landscape character of the north campus, we designed woodland planting around the periphery of the south campus and added parkland trees across the central open spaces to transform what had been a featureless space. Our bold reappraisal of the campus structure now provides an enduring landscape framework for the high quality sports facilities for which St Mary’s is renowned.